A showcase of projects and applications in academia and industry that have used gprMax. If you have an interesting project that you would like to feature, please contact us. Our publications section provides a listing of research papers that have cited gprMax. There are a wide range of different applications in the fields of engineering, geophysics, archaeology, and medicine. Especially for buried targets, like unexploded ordnance (UXO) or improvised explosive devices (IED), the frequency-dependent nature of complex dielectric permittivity can play an important role. In the frequency band of GPR, a variety of dielectric relaxation mechanisms and losses due to electrical conduction take place in a moist soil (shown in the figure). These absorption mechanisms individually act on the frequency content of the GPR wavelet while propagating through the subsurface. At our laboratory we investigate the electromagnetic properties of soils in a very broad frequency range using the coaxial transmission line technique. The figure shows a decomposition of the measured data for silty clay into 4 Debye models and a DC electrical conductivity term. 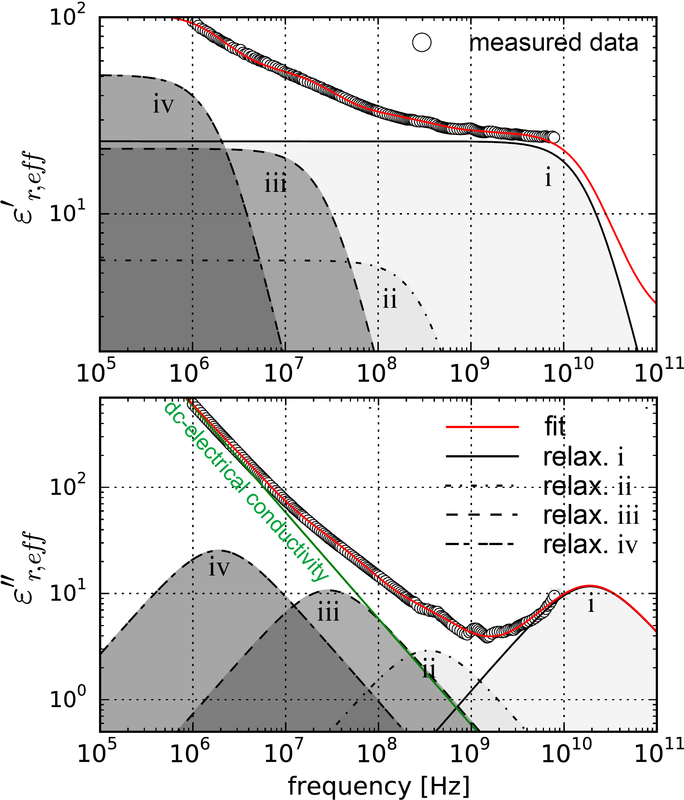 The relaxations correspond to the free water relaxation and a combination of interfacial processes (counter ions relaxation in clay interlayers, relaxation of adsorbed/hydrated water, Maxwell-Wagner effects). We use the new dispersive material modeling capabilities of gprMax for making simulations in ultra-realistic media based on the multi-pole Debye decomposition. The SENSWOOD project is focused on non-invasive investigation of tree trunks to determine internal structures and wood properties. Trees can be harmed by natural defects and biological degradation which, at an advanced stage, can lead to collapse. We are trying to eliminate accidents caused by fallen trees, especially in urban areas, and to improve a defect recognition for industrial use. It is therefore necessary to understand the internal conditions of tree trunks. The simulation was performed in order to observe the propagation of the electric field in the presence of cylindrical structures. The model consists of an air-filled cylinder (internal circle) embedded in another cylinder filled with dry sand (external circle). The background of the model is air. The simulation uses zero-offset reflection imaging with the transmit/receive point on the right of the image. A European Cooperation in Science and Technology (COST) Action on Civil Engineering Applications of Ground Penetrating Radar that is part of the Transport and Urban Development domain, and runs from 2013-2017. It focuses on the exchange of scientific-technical knowledge and experience of GPR techniques in Civil Engineering. It also aims to promote throughout Europe the effective use of this safe and non-destructive inspection method. The Action is establishing and strengthening links between universities, research institutes, companies and end users working in this field, fostering and accelerating its long-term development in Europe. There are more than 150 Institutions from 29 COST Member Countries (Austria, Belgium, Croatia, Czech Republic, Denmark, Estonia, Finland, France, Germany, Greece, Ireland, Israel, Italy, Latvia, Macedonia, Malta, Netherlands, Norway, Poland, Portugal, Romania, Serbia, Slovakia, Spain, Sweden, Switzerland, Turkey, United Kingdom) as well as international partner countries.